Introduction (C. Claeys, E. Simoen). Chapter 1. Germanium Materials (B. Depuyt et al.). Chapter 2. Grown-in Defects in Ge (J. Vanhellemont et al.). Chapter 3. Diffusion and Solubility of Dopants in Germanium (E. Simoen, C. Claeys). Chapter 4. Oxygen in Germanium (P. Clauws). Chapter 5. Metals in Germanium (E. Simoen, C. Claeys). Chapter 6. Ab-initio Modelling of Defects in Germanium (R. Jones, J. Coutinho). Chapter 7. Radiation Performance of Ge Technologies (V. Markevich et al.). Chapter 8. Electrical Performance of Devices (M. Houssa et al.). Chapter 9. Device Modeling (D. Esseni et al.). Chapter 10. Nanoscale Germanium MOS Dielectrics and Junctions (C. On Chui, K.C. Saraswat). Chapter 11. 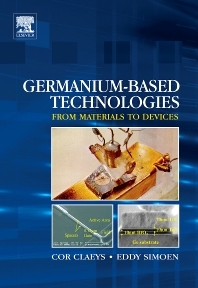 Advanced Germanium MOS Devices (C. On Chui, K.C. Saraswat). Chapter 12. Alternative Ge Applications. Chapter 13. Trends and Outlook (E. Simoen, C. Claeys).